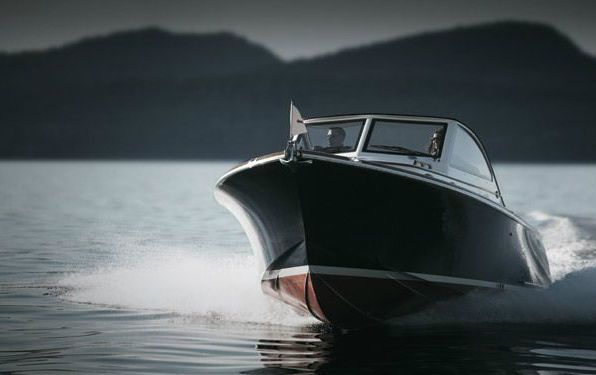 Classic lines, accomplished power and agility, a singular yachting experience. The SanJuan30 is the ideal size for day cruising with friends and family, as well as overnights for two. Luxury abounds both above and below deck with teak throughout, and fit and finish of joinery and systems typically found only in the mega-yacht class. Form follows function gracefully, with intuitively designed spaces requiring simple maintenance. 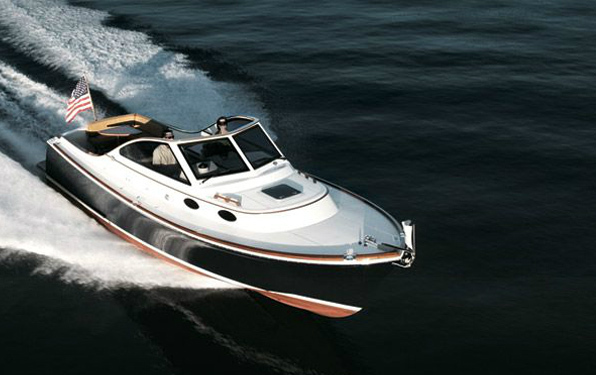 The SanJuan30 is engineered and built for confident operation in all sea conditions and for decades of service. 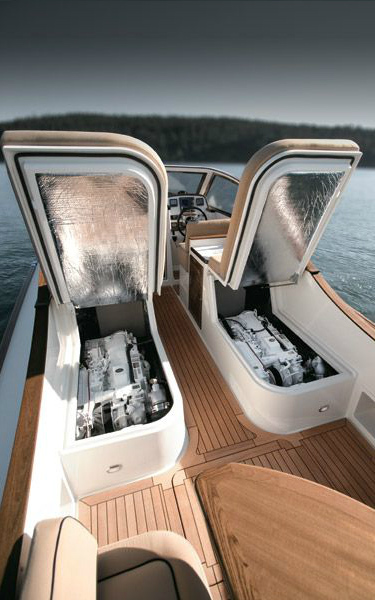 A lightweight hull coupled with efficient twin engines gives the yacht sportscar maneuverability, and craftsmanship from bow to stern is second to none. Casual cruising has never been so beautiful. 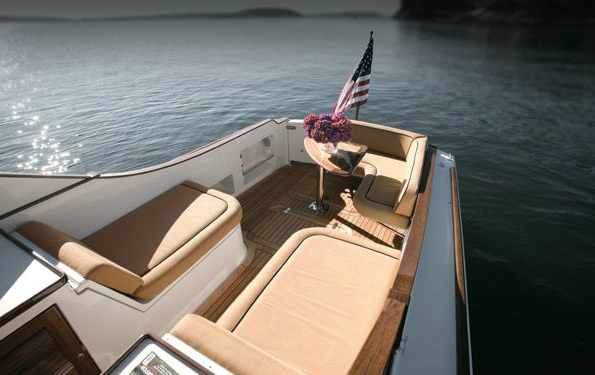 The SanJuan30 is designed to entertain guests as much as it is the helmsman. An open design philosophy makes the most of every space to give both cockpit and deck areas ample room for a wide range of activities. 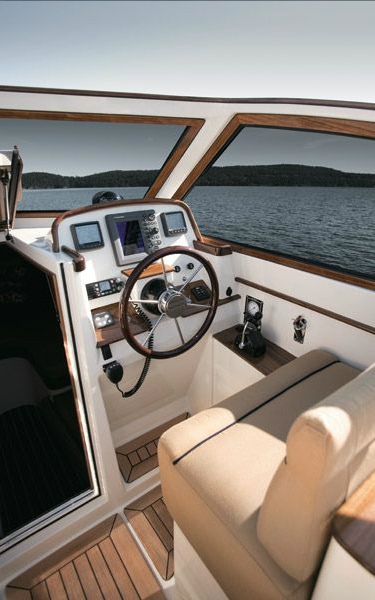 From entertaining to sportfishing, relaxing to sunbathing, the SanJuan30 offers extreme flexibility. A removable aft seat and table are available for additional cockpit seating and dining. While underway, seating for two at the helm allows the captain and a friend to share the experience. 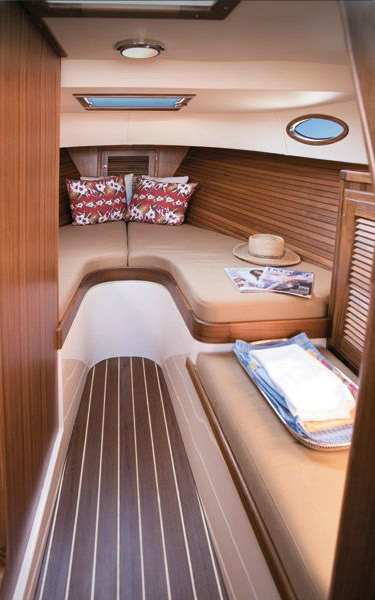 Below deck, an ample cabin is appointed warmly in gleaming teak with a satin sheen. Interior lighting is stylish. A V-berth in the bow luxuriously berths two. A large hanging locker with teak louvered doors provides storage. And a larger than expected head includes cabinets for additional storage and a standup shower.